Capitol Hill is a densely packed residential area of central Seattle. Situated just north of downtown, this is the city's entertainment district and is well known for its fast paced and hip atmosphere. Homes for sale in Capitol Hill are typical condos or townhouses and these range from small complexes to large high-rise buildings. Some single family homes are also available for sale, mostly from the residential boom in the 1930-40's. Capitol Hill also contains Volunteer and Interlaken Parks and borders the Washington Park Arboretum, a public park featuring wildlife, trails, and botanical gardens. As Capitol Hill sits on a steep slope, residents may have views of downtown, Lake Union, or Portage Bay. 1 Beds | 1 Baths | 550 sq. Ft.
1 Beds | 1 Baths | 573 sq. Ft.
1 Beds | 1 Baths | 513 sq. Ft.
3 Beds | 2.25 Baths | 1870 sq. Ft.
2 Beds | 1.5 Baths | 1024 sq. Ft.
3 Beds | 1.5 Baths | 2259 sq. Ft.
2 Beds | 1.75 Baths | 942 sq. Ft.
2 Beds | 2.5 Baths | 2030 sq. Ft.
2 Beds | 2.5 Baths | 2930 sq. Ft.
2 Beds | 2.5 Baths | 1736 sq. Ft.
3 Beds | 3.25 Baths | 1780 sq. Ft.
1 Beds | 1.75 Baths | 1035 sq. Ft.
3 Beds | 2.5 Baths | 1669 sq. Ft.
2 Beds | 2.5 Baths | 1577 sq. Ft.
2 Beds | 1.5 Baths | 1010 sq. Ft.
1 Beds | 1 Baths | 614 sq. Ft.
| 1 Baths | 472 sq. Ft.
3 Beds | 1.75 Baths | 1427 sq. Ft.
1 Beds | 1 Baths | 547 sq. 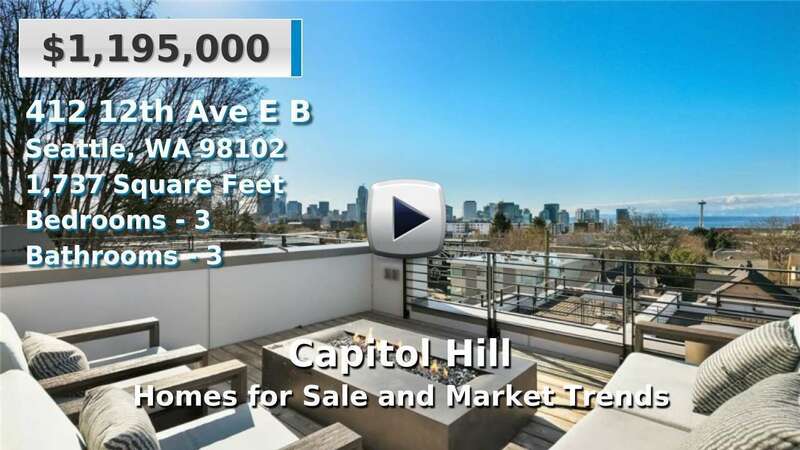 Ft.
Blue Summit Realty has the most accurate and up to date Capitol Hill real estate listings on the web. Currently there are 32 homes for sale, 53 condos for sale, and 4 vacant land properties in Capitol Hill. Of the 89 total Capitol Hill residential listings for sale 0 are bank owned, 0 are short sales, 0 are new construction, and 0 are townhomes. The price ranges from $230,000 to $0 with a median list price of $756,497 and median sold price of $657,830. Make sure to refine your Capitol Hill real estate search by property type, price, square footage, bedrooms, bathrooms and more with the search tool above or view the Capitol Hill listings on our interactive map. Our Capitol Hill real estate listings were updated 24 minutes ago.